NBC News reported that one aardvark has died and four meerkats are missing after a fire broke out at a zoo in central London early Saturday. In a statement, zoo officials said, a number of staff at the ZSL London Zoo were also treated for smoke inhalation and shock after the blaze tore through the Animal Adventure area. The zoo said, "Sadly our vets have confirmed the death of our nine-year-old aardvark, Misha." The zoo said the other animals were being closely monitored by its vets but appeared to not have been affected by the blaze. Footage courtesy of Sea World on Australia's Gold Cost from April 27 shows the adorable moments that 16-year-old mother bear Liya cuddled up to her newborn polar bear cub twins. The infant cubs, two males called Hudson and Nelson, are still very fragile and are suckling from their mum inside the maternity den to gain strength. The little tykes weigh just over one pound and are about 5 inches long. However, they will grow to be among the largest land animals in the world. Adult male polar bears can weigh over 1,500 pounds and reach nearly 10 feet in length. 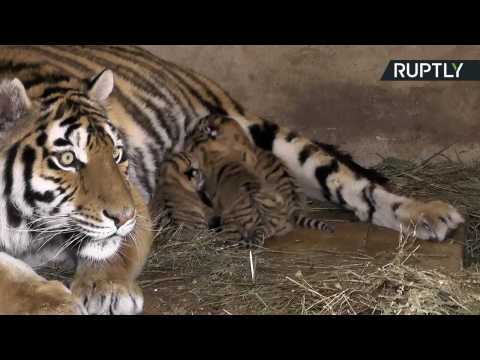 This trio of adorable newborn tiger cub triplets were filmed for the first time on Tuesday after being born at the Taigan Safari Park in Crimea. The Amur tiger cubs are mother Frosi’s first offspring, and she kept a protective eye on them as visitors were allowed to see them for the first time. According to her keeper, Frosi won’t even let the cubs’ father Felix come near them yet, and is feeding them herself – which is unusual for animals kept in captivity. Over the next two weeks, the cubs will begin to open their eyes and will start to get comfortable with seeing members of the public. Amur tigers were once found throughout the Russian Far East, northern China and the Korean peninsula, but were driven to the brink of extinction by hunting. Russia became the first country in the world to grant the tiger full protection. There were only about 400 Amur tigers in the wild when a census was taken in 2005, and researchers found that the population was declining. However, after a decade of intense conservation efforts, there are now over 550 adult Amur tigers in the wild and the numbers appear to be growing. The Amur tiger has been pushed back from the brink of extinction, for now, but careful conservation efforts must continue to protect this majestic species. Footage courtesy of the Blank Park Zoo in Des Moines, Iowa shows a newborn baby rhino bathing with her mother on Sunday. The baby rhino was born on October 11 weighing 80 pounds, standing 21 inches tall, measuring 35 inches long. The yet-to-be-named female rhino is only one of seven rhinos in the world to have been born in a zoo this year.